Announcing the Savage Worlds Adventurer’s Guild! Pinnacle Entertainment Group is thrilled to announce a brand new program for fans of Savage Worlds who want to share their content with the world. 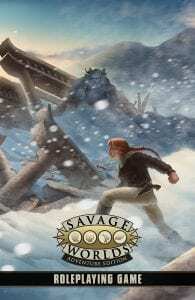 Shortly after the launch of the Kickstarter for the new edition (October 16th), we’ll open the Savage Worlds Adventurer’s Guild on OneBookShelf.com (DriveThruRPG.com and RPGNow.com). Creators will be able to make and sell their own Savage Worlds creations with the public on those platforms without going through our normal official licensing program. That program will continue with our approved partners and licensees, while “SWAG” is primarily for new creators to have a platform where they can actually sell their work. Creators retain the rights to their published products. Savage Worlds has never been an “open” license, and Pinnacle does not want to assume ownership for the creativity and hard work of contributing members of the SWAG community. Creators keep 60% of the gross sales (between OBS’ hosting royalty and PEG‘s 10%). 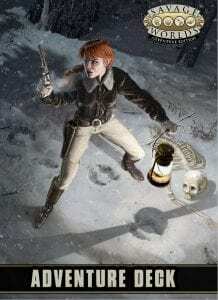 Creators have access to create homebrew content for Savage Worlds rules, but not any settings like Deadlands, Rifts® for Savage Worlds, The Goon™, Fear Agent™, etc. The Savage Worlds “Fan” license will also continue for unapproved fanmade products released for free. Official license terms have also changed slightly and those companies are now called “Aces!” Read about both the Fan license and the Ace program here. In related news, as many of you know, the new version of the rules has been code-named Savage Worlds “Black” for some time, based on an early idea of doing a stark black cover with nothing but the logo (no longer the plan…we have an awesome cover we’ll share later). 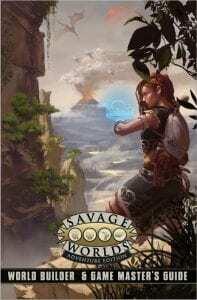 We know this might be a little… mundane… for a game that has some pretty BIG ideas, but it felt right given all the new rules and tools you’ll find inside to help you create adventures and settings to share with your friends–and maybe the rest of the world through the Savage Worlds Adventurer’s Guild!